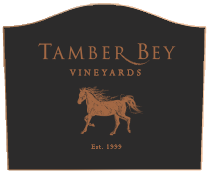 The Tamber Bey Oakville Estate is located at the southern end of Napa Valley’s famous Oakville Appellation, just north of Yountville. It has gravel/loam soil that is relatively shallow and well-suited for Cabernet Sauvignon. The vineyard is planted with more than 9,500 cane-pruned vines, clones 337 and 4, in a tight planting formation on 3 acres. Aromas of crème de cassis and crème de mure arrive first, followed by baked black stone fruits, licorice and a light smokiness. The mouthfeel is seamless, and a nice acidity keeps the freshness going through. This is a fruit-forward wine, with ample plum and cherry, and a slight mineral tone of crushed brick. The tannins are nice, soft and well-integrated. The finish delivers sage, cigar box and vanilla notes.